How would you rate this preset? Shoot me a rating out of 5! If you voted a 1-3, It would be great if you'd comment and told me why! I'm looking to improve. When you buy a BTT License through this affiliate link, I’ll get 40%! AquaTouch is the result of the meticulously controlled balance of function, minimalism, and intuitive design. It fits the most function into the cleanest interface possible, while also keeping it instinctively quick and easy to use. Already Available information by the system like Clocks, weather, spotlight, Siri, and controls like volume and brightness are not displayed because you can already access them. Don't clutter the Touch Bar with duplicate controls! See the clock in the menubar, Hold command-space for Siri. Leave that as it is. Two, three and four finger Touch Bar gestures are used adjust volume, brightness and the keyboard backlight for sightless controls and more space. They are much quicker and easier to reach, they do not require a look to activate and are much more natural to control. They even have haptic feedback, you can literally feel every level the volume goes up. 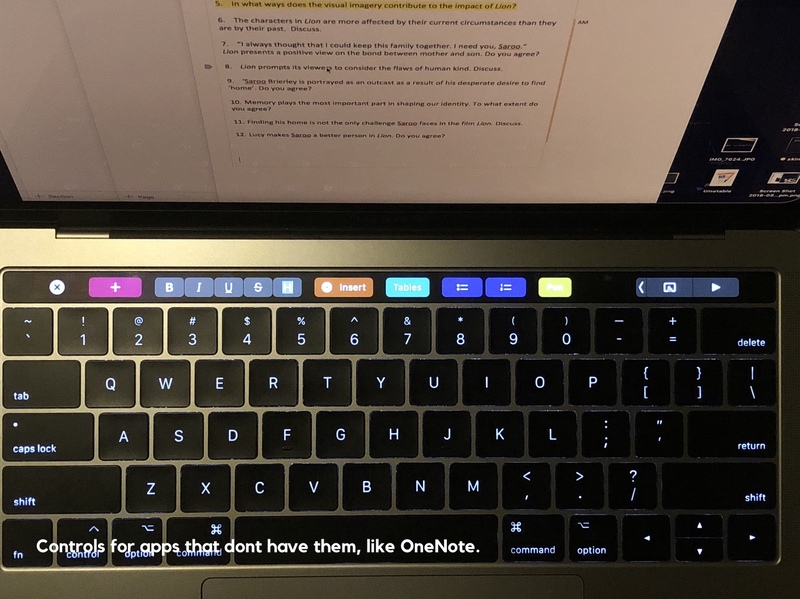 Quality, complete sets of tools for many apps that do not support the touchbar natively, such as Adobe Illustrator, OneNote and After Effects allow you to increase your workFLOW. Even websites are supported, Quickly access chats, search for friends and switch between your timeline and other views in Facebook, watch YouTube without using the cursor or format your Google Document with ease, just to name a few. Don't like the constantly changing TouchBar? Although AquaTouch is a dynamic preset, it is very carefully designed to be predictable, and puts you in control. It's automatic elements are carefully designed NOT to assume what you want, but instead preset options that don't unexpectedly replace all your current controls. AquaTouch only changes when you switch apps, just like the menu bar. It doesn't change when you select something, be it an object or window. Instead, buttons that open groups bring these object or tool specific controls to view. You control what tools you bring up. When opened, these won't close on you, and they're always there for you to open up. Since it's really predictable, I've managed to develop a muscle memory for each app! for example; When I switch to an app like messenger, the chat switch buttons show up as I remember and I just move my hand up to click them and check the latest chat. When I switch to Adobe Illustrator, I tap the 'Path Tools' group automatically to bring up all my path tools in the TouchBar, already knowing where the button is. In contrast, Apple's implementation tries to guess what you want, automatically showing you options to change text formatting when you really just want to format a text box. Take a look at the features I have so far below, or download to discover for yourself! *Note that the images here are of version 1. Many, many improvements have been made, including the removal of the system 'x' button on the left side. Extension layouts are additional toggles that compliment an app with a native TouchBar layout. Whatsapp - Switch chats and access emojis! Facebook Messenger App - Switch chats and access emojis! VLC - featuring @vipersonic's time scrubber, playback speed and fullscreen toggles! Blender - Numpad View Controls! You never knew you needed it. The AquaTouch Control Strip is a persistent toolbox that is always displayed on the right of the touch bar. It consists of four segments; Media Controls, Schedules, Controls and App Actions. This section contains media controls and Now Playing widgets. If a supported app is playing media, they will show up within this group! Additionally where available, the play buttons here directly control their app to play/pause. e.g. you can pause YouTube, then play Spotify, all from this view, without switching or opening any apps. Tap a widget to see more controls! Control your music without switching to the app! Quickly check your Calendar and Reminders. You can also view the weather and time here. Tap any widget to see a 10-event overview of what's next. Open this up to toggle system controls such as NightShift, Dark Mode or sleep your MacBook. There's a connectivity pallete to the right that allows you to connect to AirPods, Beats Headphones and toggle toggle WiFi and bluetooth. With AquaTouch, you now have tools even for websites! More Sites and chrome support coming soon! No more sliders and buttons you can't feel. Slide anywhere on the TouchBar to adjust what you always adjust, no looking needed. Stay immersed, but also informed. You want to be immersed by games, and Games want to be immersive. The result: The menubar is hidden. It may be small, but it's annoying that you're not be able to check the time, and battery percentage isn't it? AquaTouch includes a template that displays the CPU temp, Fan speed, time and battery on the right side of the TouchBar for you to keep track of vitals while you immerse yourself in a full screen game. You have the option to also display message bubbles here, letting you know that your significant others are trying to reach you without cluttering your game on the main screen. In addition to that, You can even set up your own macros with the right side statistics! add a push-to-talk button, skills triggers, button combo reminders, shortcuts to UI or whatever you want! It's part of the keyboard, not the screen. Don't waste precious space for junk that you can already see on the main screen. If it's not useful, it's not added. Keep things efficient and neat. Buttons that are global, such as brightness and volume make way for gestures and more space. Buttons such as notification centre, siri and mission control are brought up using keyboard and trackpad gestures, like they are meant to be. All Icons adhere to the apple TouchBar icon specs, matching up beautifully with the system icons and the keyboard. There are no boxy, blocky or mis-sized icons. The system 'X' button is also removed, while the entire apple control strip has been remade within AQT for the smoothest experience. Sizes, Spacing, Groups and Colours are all used to convey function. Individual buttons that are related are clustered together, grouping. Important is coloured, Second-order is grey, hierarchy. The colour of the group button matches the contents inside, context. The things you need are always present, and will stick even if you interact with view-changing toggles. When you tap into a group, the controls you want to keep stick, so you do not need to switch out of said group to access, say the select tool. Now Playing, Schedules, System Toggles and the app switcher are all neatly displayed to the right for you to get to, always. All Back buttons tell you exactly what bunch of tools you have open, and they stack to form a hierarchy if you enter a group in a group. This allows you to know your context and additionally allows you to go back in one tap no matter how many groups within groups you've travelled into. By using creative padding overloads, blank icons and negative margins, interesting and very neat layouts have occurred. AquaTouch is designed to flow with the controls set natively from apple or other apps. You can fluidly and even automatically access the raw TouchBar in all it's contextually-aware glory as if it's part of AquaTouch. This Preset is under active development, so please suggest features and report any bugs! Stay up to date and follow this thread as more features will come, and many design changes and refinements will be made. If you like this preset, Share it with your friends and comrades and also hit the vote button up at the top! I’d also appreciate some feedback and any improvements that I should make. Feedback keeps me in the know of what to add or fix up for the next versions, and i’m quite lost without it. Many features and widgets of this preset would not be possible without the community! Here's a thank-you list to all the people who let me merge and improve their stuff to put into AQT, Check them out! @GoldenChaos - Allowed me to use his great now playing, schedule and connectivity widgets! Finally, @Andreas_Hegenberg, developer of BTT for putting up with lots of feature requests that make AQT work as it can today. “Aqua” is apple’s name for the macOS design language. Much like Google Material Design, it has its principals too. So theres where the Aqua-Touch name came from! For more of my works. An icon pack which contains a massive heap of apple's native icons. [v1.0.2] Better-Touch BTT. For the Preset Pros. BetterTouchBTT is a preset that you can add to your current whatever you have. It provides touchbar controls for BTT to more easily use and edit BTT. If you're an advanced BTT user, check it out! A post with many tips for making your BTT editing much better. Learn how to copy/paste multiple items, make the advanced config panel faster and etc. VLC & Discord: Simple, integrates with the default Apple preset. Possible to remove the "X" / "Close BTT" button on custom TouchBar setups? Touchbar button/widget to show MacOS control strip? Button for adding dates to filenames. can gap on left side of first button be removed? Question: Does Adobe Lightroom have a TouchBar Set? Whoa man, this looks great. As someone who spends half their life in Photoshop, this really catches my eyes. In your experience, is this faster than using any of the photoshop shortcuts that already exist (or that you can map)? I built a bunch of Photoshop functionality as well, but I found that my KB shortcuts were faster to use. EDIT: Also, how the heck did you make those longer "backgrounds" on your buttons?? Can't wait to try this out! Do you have a link to your preset or is it still being prepared? e.g. I didnt make pages, numbers and keynote replacements becaus I found they worked quite well, and I made “extensions” for apps that need a litttle boost in functionality but work well with their naitves. I found that the photoshop controls are quite clunky to use, so I made my own. Of course, all this is based on what I use, so it hasn’t been tested for what everyone uses. As my tb design principals state, I don’t introduce useless clutter. Keystrokes that can be remembered and that aren’t used a lot aren’t included. I do include heavy use tools into the touchbar such as the move tool, so my hands don’t need to go everywhere when I use photoshop. The move tool button also sticks, or persists when hopping into other tool groups, stayig there while you need it. Quite hard to explain the experience design into this unless it’s field tested by you, but before that I would like to iron it all out and remove my personal private preferences before shipping out a beta. Awesome, can't wait to test it out! Help me add more functionality to BTT by heading over to feature requests and voting some cool suggestions! *those are not all posts from me. I sinply replied to them. How do you manage to keep a group open when you change from one app to another and come back to the previous one? Could you explain your situation more? I am trying to do the same you're doing but for Lightroom, right now I have two groups, library and develop, and it's horrible when you switch for lets say chrome and go back to lightroom and your group is closed, did you find a way to manage that with the other adobe apps? or do you suggest something/another approach? Keeping groups open while switching apps will soon be possible. @yuuiko are you any closer to releasing a beta? Personally I really want to try out integrating this into my preset since I use Photoshop heavily... I'd even take an alpha, I bet I could figure things out from there. If you don't want it released, you could DM it to me? I'm quite busy with schoolwork so expect very long delays. so yeh, It still has a lot of crude stuff going on. i'm not too literate in scripts, so scripts are currently minimal... I would like to get more scripts in and do fancy stuff, but yeh, i'd need to learn. An issue is i did change a lot of settings within apps to get the TB actions to match up with the app's keystrokes, and I don't quite remember the defaults or how to get others to set the same thing. I think it would be great if some community improvements could be made as I feel it lacks polish in some areas that I wouldn't know how to implement an improvement, so when I get something up I would appreciate some help. Also about this, I don't regularly use some of the pro apps so button suggestions are appreciated! Just a heads up, I've (attempted to) upload the preset for use. It's my first time uploading and I have a messy feeling about it all right now, but hopefully it is testable. Does anybody know how to make a group appear while spotlight is shown? I'm not too strong in code and applescript, by the way, but i have a basic understanding of it, and i'm open to expanding this understanding. I've tried this method, but getting it to close properly is quite a pain. It won't disappear with cmd+space. I tried making a 'close spotlight' button within that menu, but it will open spotlight if the user closes it using cmd+space. In this preset it would be used for the quick launcher currently assigned to the finder, which is not optimal. Also while you're reading this @Andreas_Hegenberg, Is there a way to toggle the 'macOS control strip' setting? Maybe make a new 'set BTT setting' action. This would be used for game mode. Heads up, there's a huge update coming! I've also done a heap of design tweaks and expanded on various apps. Here are only some of the many changes! I'm still sifting through for bugs, also some of the new elements are still being integrated into all apps. I hope I can release it soon! I hope this preset will be helpful to you. It seems stable enough on my end, but it's very experimental so tell me if anything goes wrong! New Automatic Setup buttons. They'll show up when you import the preset. You can just press this button and AQT will set the settings for you! Mouse Clicker tool has been reworked and is now beautiful. Improvements to OneNote, includes a format picker now to easily format and tag your notes. Various small positioning, icon and aesthetic improvements. Use of conditional activation groups where possible to make this preset very efficient. Repeated buttons are not always reloaded while switching apps, which saves power. This preset peaks at around 8-10% CPU maximum (when a large group opens, or the widget veiw is being loaded), and around 1-5% at idle.